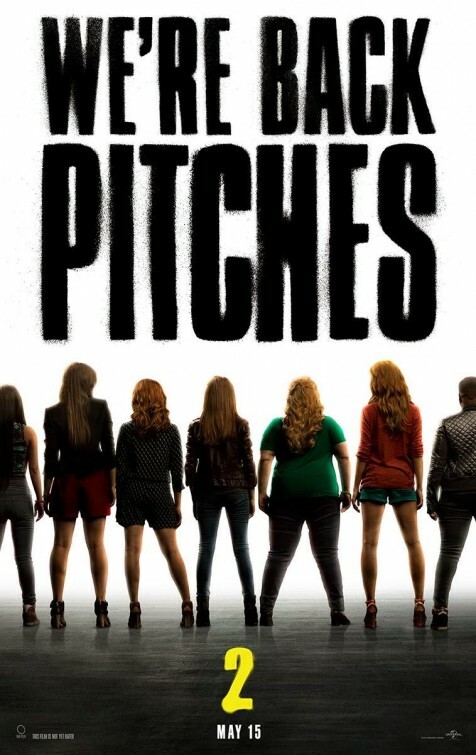 I was glad to hear the announcement that a sequel to “Pitch Perfect” one of the surprise sleeper hits of 2012, had been greenlit. 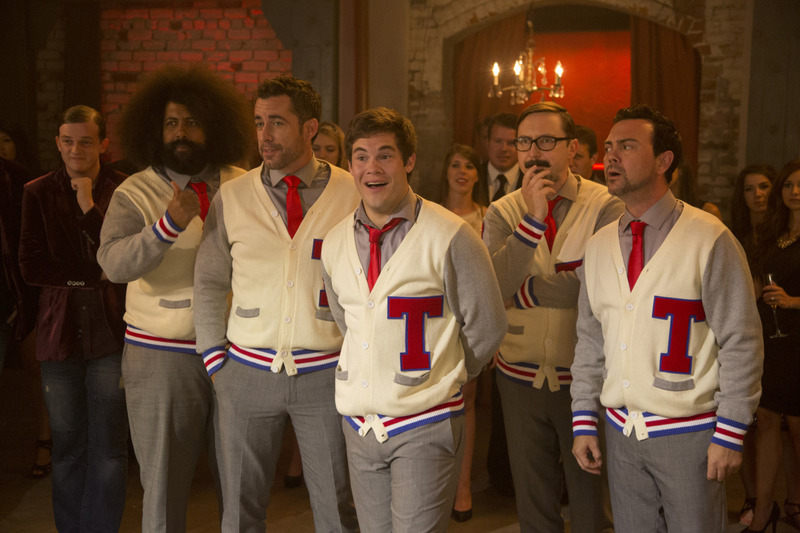 Leading up to its release, no one knew what to make of that first movie – a musical comedy revolving around fiercely competitive collegiate a capella groups. I anticipated the same amount of spontaneity, electricity and fun. Well, in “Pitch Perfect 2”, the directorial debut of actress Elizabeth Banks, there is more reverberating cacophony than sweet melody and surprisingly so considering it’s written by returning screenwriter Kay Cannon. While there are a few funny bits here, it’s ultimately a disappointing revisit that feels repetitive and predictable, lacking any originality. The Barden University Bellas won the national a capella championship three years in a row, yet their status hits a snag during a performance at a packed Lincoln Center for President Obama. Literally hits a snag when Fat Amy (Rebel Wilson) has a wardrobe malfunction and the entire world sees her genitalia – front and back. This incident results in the Bellas getting kicked out of the competition by commentators John Smith (John Michael Higgins) and Gail Abernathy (Elizabeth Banks), which spins the Bella’s morale into a downward spiral. Desperate to keep the group together, Chloe (Brittany Snow) finds a loophole and signs the group up to compete in an international competition in Copenhagen, in an effort to redeem themselves. The group will really have to step up their game and find their mojo in order to win, since their main competitor is Germany’s a capella group, Das Sound Machine, led by the intimidating/perfect, Komissar (Birgitte Hort Sorenson) and her co-leader, Pieter Krämer (YouTube sensation Flula Borg). The Bellas have some added distractions though that cause some hiccups on their way back up to the top. In search of a post-Bardem future, Becca (Anna Kendrick) has started interning at a local studio, Residual Heat, where her boss (Keegan-Michael Key) has taken notice of her talents. An uncertain Fat Amy is aggressively courted by former Treblemaker leader/current campus security guard, Bumber Allen (Adam DeVine). If that’s not enough, there’s also the addition of an eager legacy, Emily Junk (a welcome Hailee Steinfeld), a freshman and aspiring songwriter, whose mother (Katey Segal) was a Bella back in the day. The girls will have to rebuild their foundation in order to move forward as both friends and Bellas. The memorable moments of the last movie involved music. Scenes like the Bellas rehearsing and figuring out how to work together, Becca’s audition in which she sang “Cups” and the highly entertaining finales from the Treblemakers and Bellas. Those scenes were great. Along with the humor, the music was the drawing factor of that movie, making it a viewing experience worth repeated visits. The two main problems with this sequel is there’s just not enough music (which is baffling) and the humor is achingly dull. Banks and Cannon sadly rely on predictable subplots and repetitive jokes about race, gender, body image and defecation, in hopes that all that will sufficiently entertain the movie’s audience. It doesn’t. There are moments where I just sat there – not laughing where the filmmakers were clearly hoping I would. In fact, I spent more time baffled by the unfunny bits in this movie. In a sequel, you expect new characters and new elements to broaden the world you’re eager to return to. There is some of that here, but not enough. One sequence involves the Bellas getting an invite to a secret a capella smackdown inside the mansion of an eccentric host (over-played by David Cross), which humorously comes across like an a capella “Fight Club”, with the Bellas thrown into competition with the Treblemakers, the Tone Hangers, Das Sound Machine and….the Green Bay Packers (you read that right: Clay Matthews, David Bakhtiari, Don Barclay, Josh Sitton, T.J. Lang and Jordan Rodgers). What’s different about the a capella mashups we see here is the variety in the groups we see. Becca’s boyfirend, Jesse Swanson (Skylar Astin) leads the Treblemakers, which also includes Benji (Ben Platt), who’s crushing on Emily. We’re familiar with those college kids, but it’s a nice change to see how every other group consists of older singers – in particular, the Tone Hangers led by Bumper, consisting of actors/comedians such as John Hodgman, Jason Jones, Joe Lo Truglio and musician Reggie Watts, who are all clearly not college age. Taking it the music off campus and away from the realm of actual competition is a nice touch, it’s just a shame that the effeminate portrayal becomes annoying rather quickly. The actor who really hits all the right notes here is Steinfeld, who has chosen her roles wisely since premiering in “True Grit”. She seems to play her age well in each role, as seen in last year’s “Begin Again” and “3 Days to Kill” and delivers an authenticity to Emily’s excitement and nervousness about becoming a Bella. She’s got solid singing chops too and recently just landed a record deal. Good for her. Sadly, the two off-putting characters of the picture are the minorities of the Bellas. There’s the socially awkward Lilly (Hana Mae Lee), the Asian girl from the last movie who once again drops inappropriate lines under her breath and a Guatemalan student named Flo (Chrissie Fit), a new addition whose only lines are scene-stopping remarks that play to racist stereotypes. It’s not just that these characterizations are insulting, but they’re also tiresome since they play up the same jokes again and again. As the only African-American, Cynthia (Esther Dean), a returning Bella, fares slightly better, but even she is left with a one-dimensional “black/female/gay” characterization – that even the character promotes! – which feels like a broken record. As a director, Banks is serviceable, at best. She puts together a competent picture, but her musical numbers really lack the energy of the previous film. Some of the plotlines Banks encourages should’ve been left on the cutting room floor, since they don’t serve the overall narrative of young women trying to find their own voice/strength. Banks can handle the comic bits just fine, but editor Craig Alpert chops up the rhythm of the competitive numbers, allowing the potential excitement of these scenes to disappear into the ether. Overall, the filmmakers here have made a movie void of any discernible style or personality. While I would like to celebrate a movie directed and written by women, focusing on a group of young women, I just can’t get over how lazy and unoriginal it ultimately is. It’s disappointing. At the end of the last movie, so many of the songs burrowed in my brain, which led me to purchase the soundtrack and play it repeatedly. Not with this movie. I’m happy that “Pitch Perfect 2” is earning success at the box office, I just wish it made me feel the same way the previous movie did. If the “Pitch Perfect” movies are to be a successful franchise, like say, the “Fast & Furious” movies, than the focus really needs to be on dazzling viewers with great choreography and catchy tunes. Show us different takes on the a capella world each time, instead of trying to play the same song for us over and over again. Or they can just invite Dwayne Johnson. This is sounding more and more like a disappointment.